Storm was guardian at the Pavilion and the comments are Storm's. Already the regulars, including a bunch of Europeans, were arriving. Storm Nordwind: How are you today? Adams Rubble: A little harried but catching my breath. How are you? Storm Nordwind: Not too bad. Hi Fael! Storm Nordwind: I was reading your blog and saw how busy you were. It's nice to see you take a few minutes out to visit here. Storm Nordwind: Who or what is it about now? Meanwhile, Fael was parachuting in another new visitor! Fael Illyar: if he gets my tp. Storm Nordwind: Welcome Mr. Drake! Eponymous Drake: Hello Gaya Fael. Eponymous Drake: Hello Storm, Adams. Eponymous Drake: thanks for inviting me to the group. Storm Nordwind: How much do you know about what we do Eponymous? Fael Illyar: I didn't have time to explain almost anything. Fael Illyar: Play as Being is a group of people who do these so called "explorations", some more and some less. Some just come to the meetings. Fael Illyar: the exploration is a 9 second "pause from everything" that we do every 15 minutes. Storm Nordwind likes people with a sense of humour like that! Fael Illyar: There is a blog at http://playasbeing.wordpress.<wbr/>com/ where logs of our meetings are posted. hopefully you don't mind your name and/or what you say being logged there? Storm Nordwind: Nice one Faenik! Fael Illyar sometimes has doubts about the randomness of SL's random number algorithms. Gaya Ethaniel: light on the table? Fael Illyar: ctrl-alt-t once to see it, second time to hide again. While Eponymous was away, I picked up on something Adams had said about it being her 6 'weekiversary'. Storm Nordwind: Well, while our friend Eponymous is away, I'd be interested to know about your last 6 weeks Adams. Big changes? Little changes? No changes? Fael Illyar: yes, the starting point. That's the important point. Storm Nordwind: Actually, many people go through their whole life without realising it might be a good idea to find tools in the first place! Fael Illyar: Yes, many people sadly aren't even interested in knowing the tools. Fael Illyar: even if they're told about them. Gaya came in with an interesting experience linking emotion and exercise. Gaya Ethaniel: may i add something? Fael Illyar wonders how long this needs to be repeated. Fael Illyar: doesn't anger kind of prepare you for physical exercise? Eponymous, who had been away, managed to rejoin us. Eponymous Drake: is there a good place for me to read up on what you are doing in "Play as Being?" Eponymous Drake: I don't mind what I say being logged on the blog. Eponymous Drake: 9 seconds doesn't seem quite long enough to do much. Fael Illyar: doing it every 15 minutes trains you in being able to let go and reclaim fast. Eponymous made a game suggestion. I couldn't resist the obvious comment! Eponymous Drake: Do any of you use "twitter?" Quilty Bookmite: What is twitter? Fael Illyar: I sometimes use it to check on tweets from one person. Quilty Bookmite: Ah yes. I have heard of it. Fael Illyar doesn't have a blo... well, ok not exactly correct, I just don't have anything there. Storm Nordwind: and break new ground as we do so. Storm Nordwind: and these people are great! Storm Nordwind: Adams is on a strict 30 minutes attendance here! Eponymous Drake: I must thank Fael for telling me about this. Eponymous Drake: It might just be what I've been trying to find. Eponymous Drake: Experiments in being. Storm Nordwind: That may be possible, yes! Storm Nordwind: You should say those words to Piet, Fael! Quilty Bookmite: Oh, not good. I hope your 2 year old is better. Quilty Bookmite: 9 p.m. for me. Fael mentioned the Z word! Fael Illyar: Zen is perhaps the closest to PaB, ideologically. Fael Illyar: Being and Zen might be the same or might not. Eponymous reminded us of a familiar story, only in a new version (to me at least). It was Zen in origin and that led to talk of paradoxes. Storm Nordwind: That is a very old Zen story with many variants, yes! Gaya Ethaniel: how does PaB reminds you that story Eponymous? Quilty Bookmite: they aren't really paradoxes. Fael Illyar: come to think of it, I no longer feel the things about Being or Zen are paradoxes. Gaya Ethaniel: are we talking about seeing the whole not breaking things down? Eponymous Drake: OK, I must go eat something. Storm Nordwind: First catch your mango! Quilty Bookmite: Good to meet you Eponymous. Eponymous Drake: I will try to attend. Fael Illyar: haha, do you want my cron script that I use to play the sound? Quilty Bookmite: Hmmmm. I'm sure I could knock something together in Java. Quilty pleasantly surprised me by suddenly bringing up a favourite topic of mine! Quilty Bookmite: I have had some thoughts. So far I haven't built anything in SL. Quilty Bookmite: I have in mind a project. I want to build an Avalokitesvara shrine. A small hut for one person to meditate in. Quilty Bookmite: I would like to script it so that only one person can be in there at a time. Quilty Bookmite: It may not seem very social but there are loads of places for group meditation. Quilty Bookmite: It would be very much in the tradition of the order I am in. Quilty Bookmite: And I want to include a meditation timer which would play appropriate gongs. Storm Nordwind: I would be tempted to ask Avalokitesvara what he wanted - but that's just me! Quilty Bookmite: Thank you Storm. Quilty Bookmite: the monastery I occasionally go to has such a shrine. It's a lovely little hut by a waterfall. 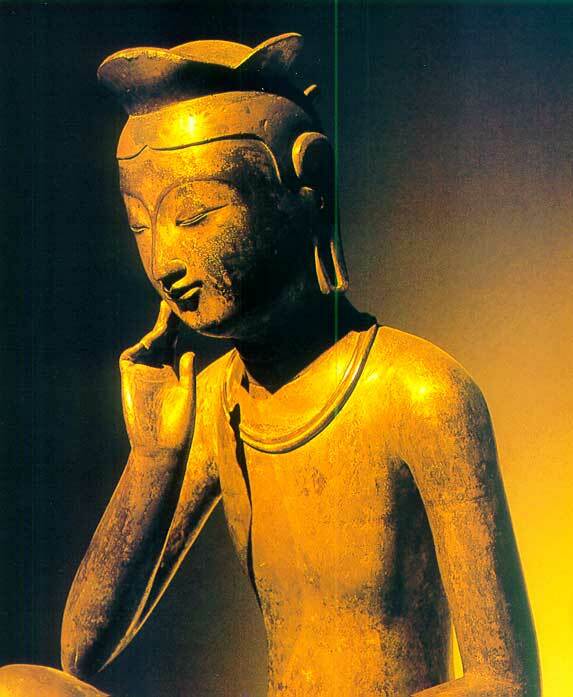 Gaya Ethaniel: have you seen the seated Maitreya from Korea? Quilty Bookmite: Ah yes I have seen a close-up of the face. Truly beautiful! Quilty Bookmite: What would you like to do with Maitreya? Fael Illyar: too bad Adams left, I'm sure she'd have loved the topic. Quilty Bookmite: Maitreya is the Buddha that is yet to come. Storm Nordwind: Will you have a statue or an image Quilty? Quilty Bookmite: There is a very westernised image of Avalokitesvara painted by a monk in the order I am in. I was thinking of asking permission to use it. Storm Nordwind: Wow. How many arms? Quilty Bookmite: She (looks very female in this case) is sitting on the head of a dragon surrounded by stormy waters. Fael Illyar: what's this with more than 2 arms by the way? Quilty Bookmite: And pouring water from a small flask. Quilty Bookmite: Avalokitesvara has a thousand arms and a thousand eyes. Storm Nordwind: A little like the one behind one of my waterfalls? Quilty Bookmite: I haven't seen it. I will take a look. Quilty Bookmite: There are many different forms. Quilty Bookmite: Avalokitesvara and also Achalanatha are two figures that come up often in my practice. Storm Nordwind: Why do you think that is? Quilty Bookmite: They both represent aspects of compassion - which for me is a very complex thing. Quilty Bookmite: Well, he is supposed to be fierce. Storm Nordwind: Check out two of the pictures in my gompa! Storm Nordwind: I am thinking of going there now. You are welcome to come and see those pictures I mentioned. Quilty Bookmite: I probably need to go soon but I'm sure I can spare a few minutes. Storm Nordwind: Then I will say goodnight Fael! Quilty and I went off to Mieum and the Kuan Yin Terraces.